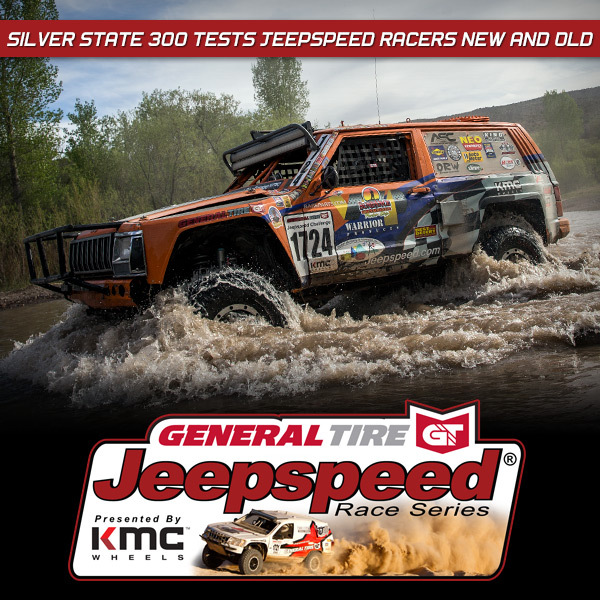 The General Tire Jeepspeed series presented by KMC Wheels is attracting a bevy of new racers to their series. Their class structure allows a wide range of race vehicles to compete, and the competition is fierce. 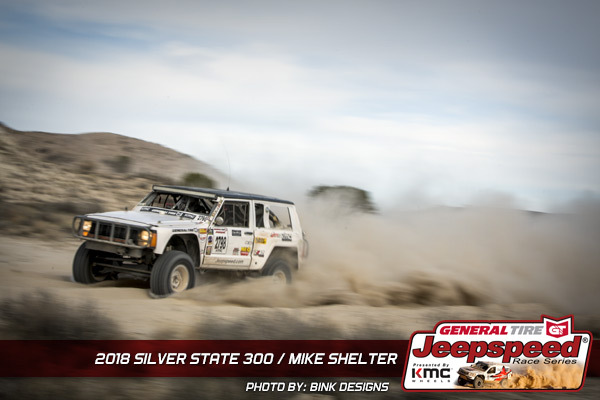 At the Best In The Desert series Silver State 300 race outside Alamo, Nevada, both new and old Jeepspeed racers had their resolve tested. The course contained everything nature can dish out. There was deep silt, rocks, and ruts over much of the 300 miles. 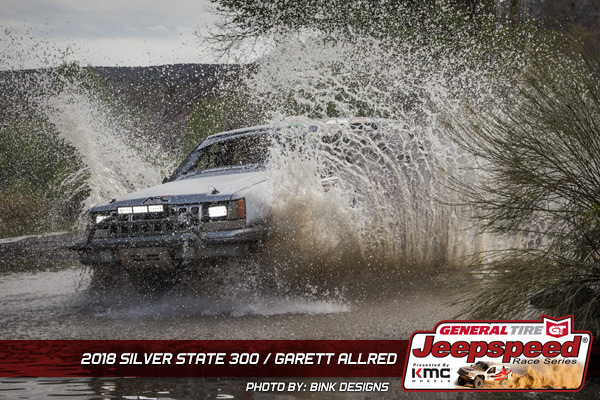 Racers had to traverse wide open valleys, tight, twisty mountain trails, and deep water stream crossings. Just surviving the course was difficult, the competition made it even tougher. Those who came out on top gave credit to a sound strategy, and a little luck. Also competing for the first time was the #1706 team of Jeff Garzik from Atlanta, Georgia. “It was a good trial by fire,” says Garzik, It was my first race, as the new owner of "Little Red" the Jeepspeed rental truck. We were crew-light, leaning heavily on Baja Pits. We had our experienced driver and mechanic Skyler Gambrell, and one chaser. Skyler drove off the starting line, and the Jeep seemed to be under-powered. Skyler diagnosed it as a possible fuel pump issue. We stopped for repairs several times on the course, but never hit full power. Our plan was to swap drivers at Pit 3. Due to the power issue, I hopped into the seat at Pit 2, with Skyler in 2nd seat calling turns, and giving this rookie a lesson. We continued to stop to bleed air from the lines, tried swapping a few things, and regained a bit of power. My inexperience in the silt, and an under-powered truck, finally saw us stuck just shy of Pit 4. We were within sight of a road crossing, and a BITD truck wheeled up to us within minutes to yank us out. We called it a day at the road crossing, being too far behind and limping along under-powered. We are on to Vegas-to-Reno next. 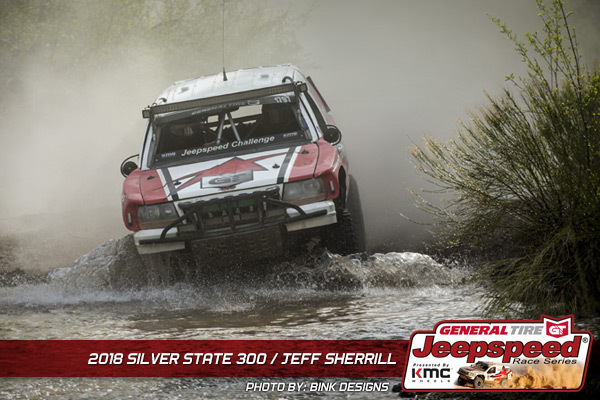 Our big task will be finding co-drivers and a crew for this Atlanta native!” It’s obvious that Jeff has the spirit it takes to do well in offroad racing and look forward to seeing him at V2R. 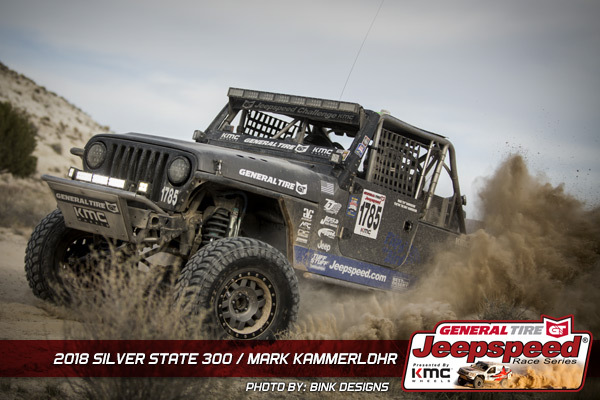 Finishing in second place in Jeepspeed Challenge was #1797 Jeff Sherrill, and Tim Martin, #1772, was third. 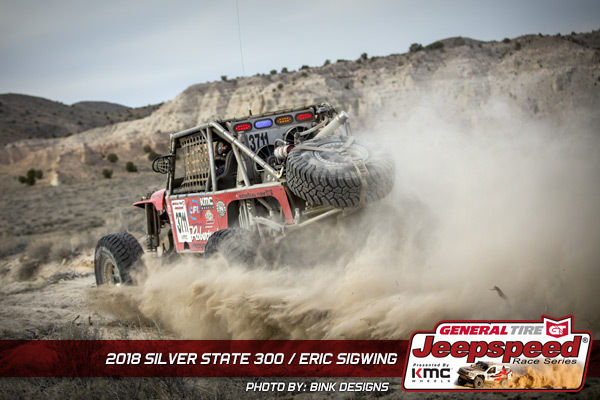 In class 2700 Jeepspeed Cup, Mike Shetler had a clean run for the win but it wasn’t without some interesting moments along the way. 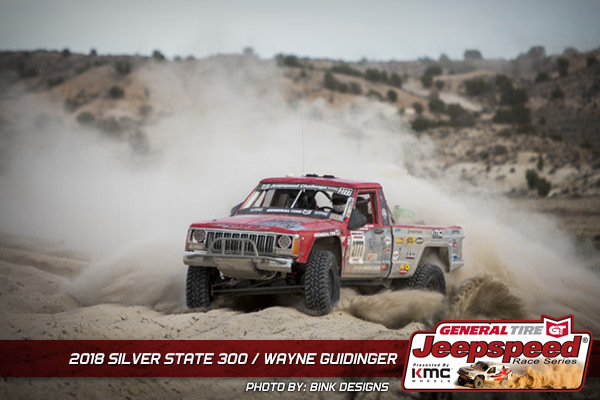 “We had a good run going when we got to the real twisty stuff through the pinion trees,” said Shetler, “We came around a corner and saw Will Heaton on the outside of a turn, high-centered on the berm. We stopped and hooked a strap to him to pull him off. We were ready to unhook the strap when another Jeepspeed (Dzierzanowski) came around the turn and tried to shoot the gap between us. He hit my truck and the strap got wound around his rear axle. It pulled us together with all three trucks tied together. The strap was so tight, we couldn’t get the knots out. Everyone got around us as we tried to get free. I remembered that 6 months ago when we were out testing, I found a knife in the dirt and tossed in the truck. I found it and was able to cut the strap. We lost more than 10 minutes to the field. We settled into a steady pace and got by a couple cars. 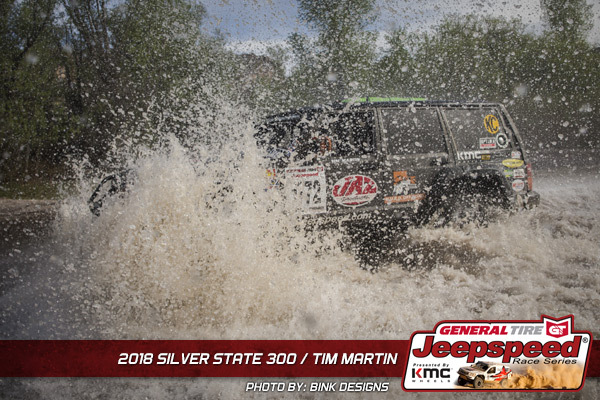 We got word over the radio that Tim Martin was stuck in some silt at race mile 202. We were battling with Wayne Guidinger but saw him having a tough time climbing a steep silt hill a few miles back. We got up it the first try, and hoped we had built up enough of a gap to stop and help Tim. We got him hooked up and towed him to pit 6. We took off towards the finish, and hopefully the win. We were running in 2 wheel drive when a Jeepspeed 3700 class went past us and blinded us with dust. We hit a deep silt hole and got stuck. 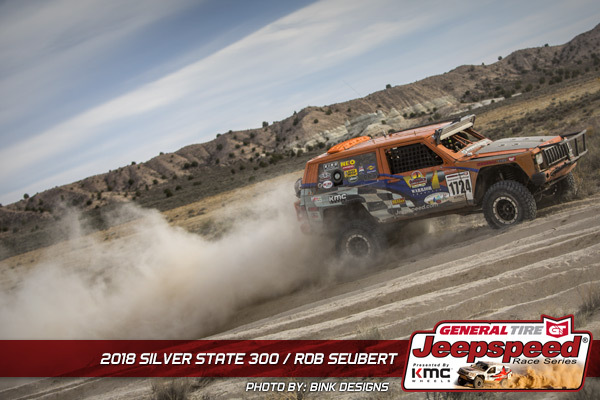 Just as we were getting out, Tim Martin came up on us and stopped to pull us out!” The Jeepspeed series is known for the camaraderie that exists between the racers in all three classes. Mike Shetler’s good will towards other racers paid off in the end. He finished 1st place, beating Wayne Guidinger in 2nd by nearly an hour. 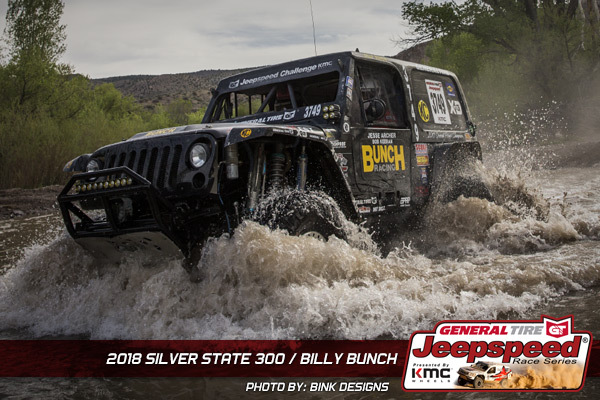 In the 3700 Jeepspeed Outlaws, the veteran Billy Bunch had the winning strategy. “It was tight, twisty, and very slick in the mountains,” said Bunch, “I got past Heaton but it was very dusty. I was running in 2wd and slid wide in a turn so I slowed down a little. That’s when I got another Jeep on my tail. I pulled over and let them go. Another Jeep passed me but I wasn’t worried. I knew the LS motor in my Jeep would track them down again. I passed everyone back except Sigwing, and after Jesse got in the truck, we passed them all.” Will Heaton had even more trouble after getting untangled from Shetler, and Dzierzanowski. 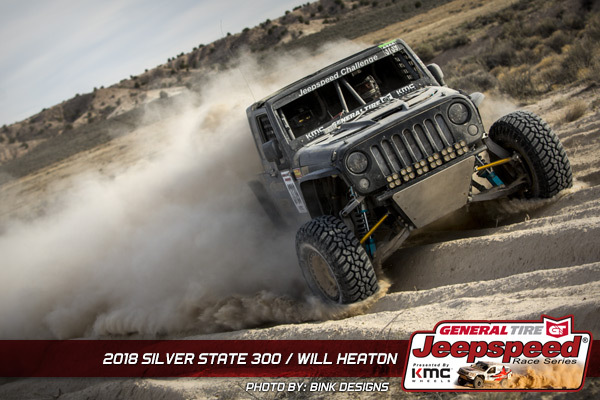 “We got stuck in the silt, and broke the steering shaft on one side,” says Heaton, “We could have run for a while with only one tie rod, but when we tried to get going, the transmission was toast. 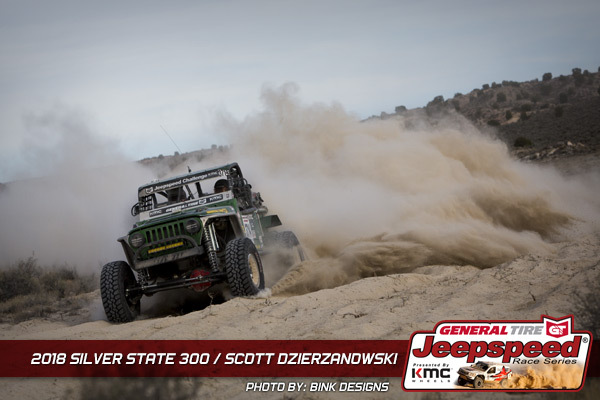 Even though we didn’t finish, I had a blast.” Rookie Scott Dzierzanowski, who podiumed in his LS powered Wrangler at his first 2 races, went on to finish on the podium again in 2nd, and Eric Sigwing finished 3rd.